Wild: Were it not restricted to the waters, Carcharodon ultramegalodon might be the most dangerous creature on the island. Domesticated: If someone is able to tame this beast, that person would be the undisputed ruler of the oceans around the island and would have access to resources no one can safely find! 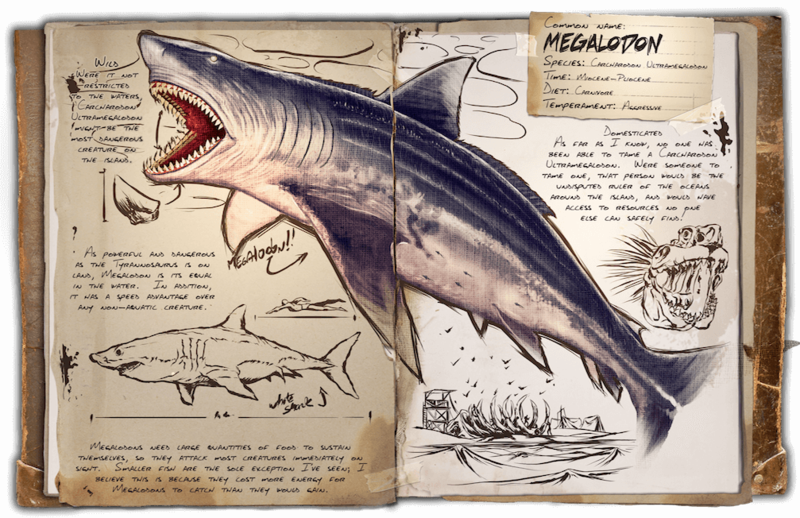 Known Information: As powerful and dangerous as the Tyrannosaurus is on land, Megalodon is its equal in the water. In addition, it has a speed advantage over any non-aquatic creature. Megalodons need large quantities of food to sustain themselves, so they attack most creatures immediately on sight. Smaller fish are the sole exception I’ve seen; I believe this is because they cost more energy for Megalodons to catch than they would gain.